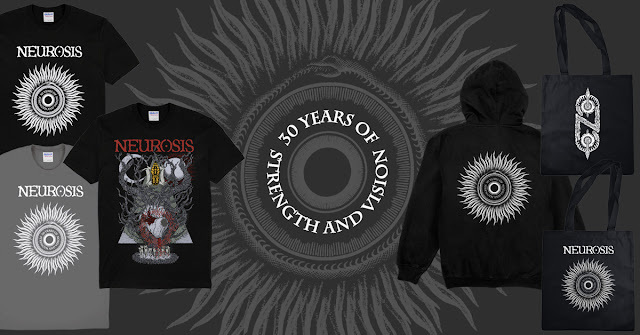 After wrapping up performances at San Francisco's Regency Ballroom and in The Netherlands at Roadburn Festival commemorating three decades of sonic brotherhood, NEUROSIS has now made its special-edition 30th Anniversary merchandise available for pre-order through Neurot Recordings. Santos 30th Anniversary t-shirt: Designed by prolific artist and illustrator Santos, the front of this shirt features the six-color poster artwork designed to promote NEUROSIS’ 30th Anniversary shows in both the United States and Europe. The back of the shirt highlights an additional four-color design, also by Santos. Hooper Mandala t-shirts and hoodie: Designed by Thomas Hooper, the t-shirt designs are offered in both black and grey, and in ladies’ styles, all featuring a one-color mandala drawn by Hooper on the front, and the back of the shirt shows the Neurot Recordings logo. The hoodie shows the Hooper artwork on the back, and the Neurosis/Neurot Recordings logo on the left chest. Hooper Mandala tote bag: The signature Thomas Hooper 30th Anniversary mandala design is replicated on a cotton canvas tote bag. Neurot Recordings logo bag: The Neurot Recordings logo is printed in white ink on a cotton canvas tote bag. Pre-orders for all NEUROSIS 30th Anniversary merchandise can be placed at THIS LOCATION. All merchandise will begin shipping in early- to mid-June 2016. Following their monumental milestone 30 year anniversary shows in San Francisco and at Roadburn Festival, NEUROSIS reveal more live shows in summer. New album details will be revealed in the coming months.